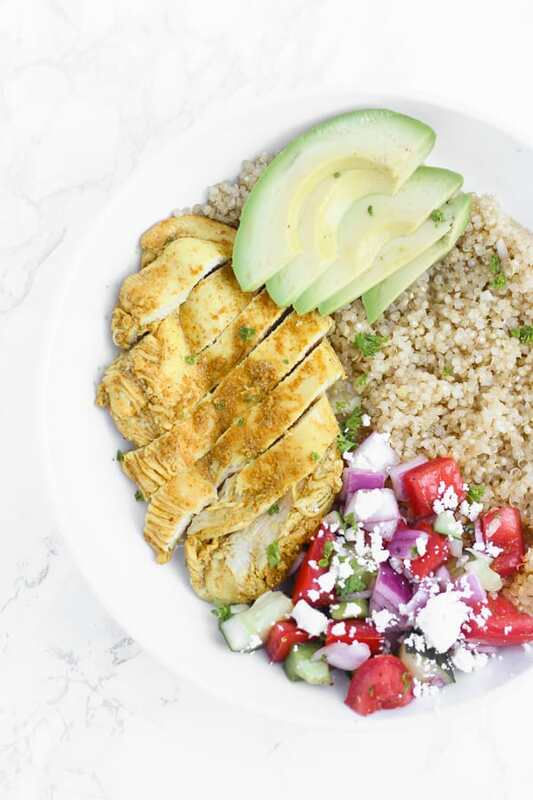 These chicken shawarma quinoa bowls have seasoned chicken, a fresh Mediterranean salad, and quinoa. Top them with avocado, tzatziki sauce, or hummus! A lot has happened since we last caught up! I took the LSAT and practically danced out of the test because I was so happy to be done. I drove straight to pick up a pint of my favorite Graeter’s cookie dough ice cream to celebrate after a year of studying. Fingers crossed I won’t be retaking that test and that you’ll never hear me mention it again! And I spent the past four days at Bald Head Island, a North Carolina beach, with one of my best friends and her family. We spent our days running, reading, and swimming in the ocean. It was pretty much a perfect vacation with sunny weather, lots of laughs, and good food. After the LSAT, I also started working full-time at my non-profit legal internship and have settled into the 9-5 groove. Oh, and I tried out a few new recipes. One was chicken lettuce wraps that tasted good but were pretty ugly, so they were kind of a flop. But these chicken shawarma quinoa bowls were awesome. My family members are my most reliable (and honest) recipe critics and they loved these– even my dad. 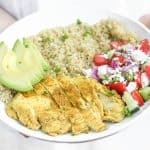 These bowls have shawarma-seasoned chicken (paprika, cayenne, turmeric, and cumin, plus lemon juice and olive oil), quinoa, and a fresh Mediteranean-style veggie salad. And then you can go nuts with toppings- avocado slices, tzatziki sauce, and hummus are great options (we used all of them!). 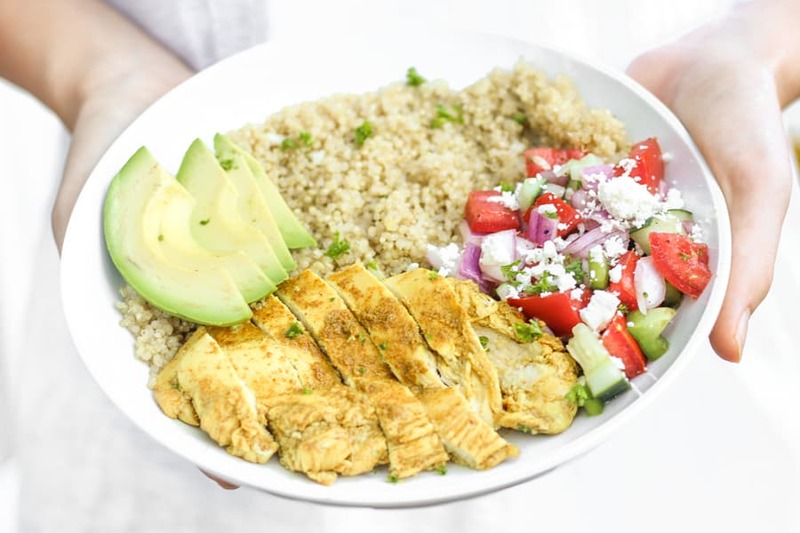 If you try these chicken shawarma quinoa bowls, feel free to let me know in a comment or take a picture and tag me @livbane on Instagram. Hope you enjoy! In a medium or large bowl, combine cumin, turmeric, paprika, and cayenne with the juice of half of the lemon, plus 1 tablespoon of olive oil. Add chicken breasts and place in refrigerator to marinate for 10 minutes or up to 4 hours. In a sieve with small holes, rinse quinoa (this helps remove any traces of a bitter coating). In a small saucepan, add quinoa and 1 1/2 cups water. Bring to a boil and then turn to medium-low, simmering for 10-13 minutes or until quinoa kernels have "popped." Set aside. I like to add garlic powder and a pinch of salt to my quinoa, in addition to fresh parsley if I have some on hand. While quinoa is cooking, cook chicken. In a large skillet over low heat, add 1/2 tablespoon of olive oil. Add chicken breasts and return lid to pan. Cook for 4-6 minutes per side, until chicken is cooked through. In a medium bowl, add cucumber, bell pepper, red onion, and tomato. Add 1 tablespoon olive oil, lemon juice, salt, and pepper, and stir to combine. In large bowls, layer quinoa, sliced chicken breast, veggie salad, and toppings. Enjoy! The chicken seems like a pretty easy dish to make! I’ll have to try them out. I tried this recipe last night. Fresh and delicious! Yay, I’m so glad you enjoyed it!! This is one of my new favorite dinners! In New Mexico there are so many health food stores that you would have a ball trying out new recipes. I am glad that you posted this recipe. Hope you had a great trip to New Mexico! Can’t wait to hear more about it! 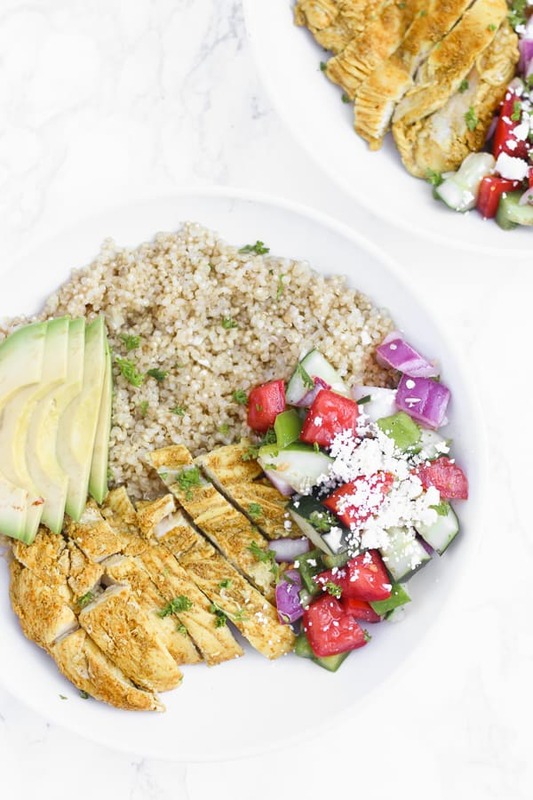 Mexican bowls are definitely my go-to bowl, too, but I agree, these Mediterranean bowls are awesome for switching it up! Thanks for pinning, Claire! Ooooh, these look so so good! I’ve never had shawarma before! They were really good- one of my favorite dinners from the last few weeks for sure!